The Tesla Collection - The "Tesla Collection" is the most comprehensive compilation of newspaper and periodical material ever assembled by or about Nikola Tesla. Nikola Tesla is widely recognized as the father of the modern electrical and radio age having invented them both. Other significant contributions were AC current and fluorescent lighting. Without these and other inventions modern society would not exist. While George Westinghouse and the companies he owned were among the first to fully develop and exploit the advantages of the Alternating Current system devised by Tesla, Edison and Morgan were much less supportive of the brilliant inventor. Tesla was actually employed by Edison when he first came to the United States, who persuaded him to redesign Edison's existing Direct Current generators and motors for a promised bonus of $50,000. Tesla did so, leading to great improvements in efficiency, only to have Edison refuse to pay the bonus, claiming the entire thing was a joke. Tesla resigned immediately. Not only did this ensure Tesla's lifelong distaste for Edison, Tesla's own Alternating Current system was in direct competition with Edison's DC system, in which Edison had a massive capital investment. This dispute between AC and DC erupted into the famous "War of the Currents" in which each side attempted to prove their system superior. Edison was unable to do honestly claim superiority on technical grounds, because DC power could not be transmitted long distances at safe voltages, so he did the next thing that came to mind: Try to make AC into a threat to public safety. Edison subsequently invented the electric chair and persuaded the State of New York to use it to execute criminals. With AC equipment of course. This first use of electricity for capital punishment was horrifying, and the condemned man had to be zapped twice. Edison also organized public demonstrations, including the electrocution of an elephant, all to try to prove that AC is dangerous. In fact, the very nature of DC makes it more dangerous and less efficient that AC. Since the current is continuous, any contact with a DC source will cause muscles to clench continuously, making it very difficult to let go. So Edison was incorrect on both efficiency and safety, and today multi-phase Alternating Current, as invented by Tesla and developed by Westinghouse, is the standard for industrial, residential, and commercial electrical systems. When one examines the historical record, the assertion that this development was supported by Edison can be seen to be nothing short of absurd. I would appreciate your correction of this error. "While working for RCA under the name "Terbo", Tesla maintained his two penthouse suites atop the Hotel New Yorker. One penthouse was his living quarters, the other a full-scale research laboratory. Tesla designed and built small compact and portable aether energy receivers, a developmental path, which he pursued to his passing. 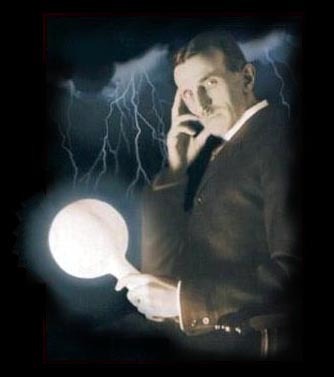 Tesla had long investigated the use of pure dielectric field energy, a stream of aether whose individual pulsations were so very ultra short that science had never found a means to harness the energy impulses. Tesla later held the opinion that dielectric current was composed of radiant particles, aetheric in nature. He therefore sought natural sources in which native dielectric fields could be used as they were, without the need for mammoth voltage "shocks" to stigmata aetheric currents. Tesla knew that if dielectric aether streams could be directly engaged, a true world of the future would be in his grasp. Furthermore, the mass-production of thousands and ten of thousands of such power receivers would be an unstoppable army. An army of miniatures, which could never be torn down. The implications were fathomless. Tesla had found a truly new and wonderful approach to an old problem. Once because his technology had not yet grown to the level where this was possible, he had to settle for impressing the naturally prolific aether streams with "extra" pulsations. The Transmitter method was costly, gargantuan, and an easy target for those who hated the notion of a future world where dreams rule humanity. Dielectric energy fascinated Tesla. It was everywhere, a natural emanation whose potentials far out proportioned conventional notions of power. Indeed, the early conception of natural radioactivity as an energetic source was nothing in comparison to the potential power inherent in dielectric streams. The new technology would use ultra-short pulsing aether streams, energies that occupied most of his latter press conferences in latter years. Study had convinced Tesla that the apparently smooth and native force characteristic of dielectric field energy was actually a particulate flux, a succession of ultra-short impulses. The derivation of such an impulse train would solve all energy needs for eternity with an elegance far out-reaching his own." The Tesla Collection The "Tesla Collection" is the most comprehensive compilation of newspaper and periodical material ever assembled by or about Nikola Tesla.